On Friday, two MSF flags were placed on the roof of the hospital, in addition to the existing flag that was being flown at the entrance to the Trauma Centre.8 The KTC was also one of the only buildings in the city that had full electricity from generator power on the night of the airstrikes. 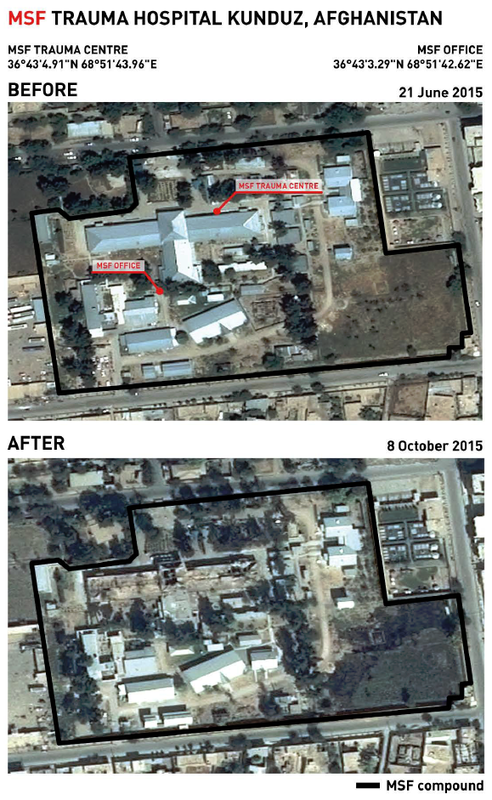 In the hours before the airstrikes, MSF was contacted by French and Australian diplomatic officials and informed that MSF international staff in the KTC were at risk of being kidnapped. This alert came in addition to a request that had been received from French Embassy officials on Tuesday 29 September, where MSF was asked for the cell-phone details of its international staff in case of kidnapping. Included in the MSF team were two French nationals and one Australian national. The other nationalities of the international team were: Cuban, Malaysian, Hungarian, South African, and a Filipino. As part of MSF’s own assessment of risk, in-depth discussions were held with the MSF team in Kunduz, Kabul and at headquarters to evaluate the kidnapping risk. A decision was taken, based on an independent assessment of risk, to increase the security measures against kidnapping. All national and international staff that were not on duty were instructed to sleep in the safe-rooms in the basement and administrative office. At 10pm, there were more than 100 MSF staff and caretakers sleeping in the basement below the intensive care unit (ICU) and inpatient department. This basement had been prepared as a safe dormitory in the event of clashes getting closer to the hospital. Those who were awake after 10pm report having noticed how calm the night was in comparison to the intense fighting of the previous days. Throughout the night before the airstrikes began, all MSF staff confirm that it was very calm in the hospital and its close surroundings. No fighting was taking place around the hospital, no planes were heard overhead, no gunshots were reported, nor explosions in the vicinity of the hospital. Some staff mention that they were even able to stand in the open air of the hospital compound, which they had refrained from doing in the days prior, for fear of stray bullets from fighting in the neighbourhood around the hospital. All staff confirm that the gate of the hospital was closed and that the MSF unarmed guards were on duty. Despite it being in the middle of the night, the MSF hospital was busy and fully functional at the time of the airstrike. Medical staff were making the most of the quiet night to catch up on the backlog of pending surgeries. When the aerial attack began, there were 105 patients in the hospital. 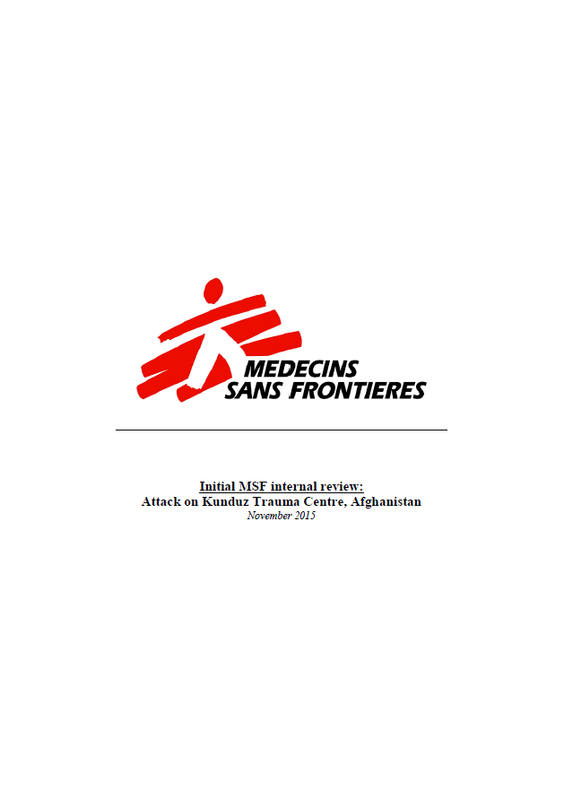 MSF estimates that between 3 and 4 of the patients were wounded government combatants, and approximately 20 patients were wounded Taliban. One hundred and forty MSF national staff and nine MSF international staff were present in the hospital compound at the time of the attack, as well as 1 ICRC delegate. A series of multiple, precise and sustained airstrikes targeted the main hospital building, leaving the rest of the buildings in the MSF compound comparatively untouched. This specific building of the hospital correlates exactly with the GPS coordinates provided to the parties to the conflict (GPS coordinates were taken directly in front of the main hospital building that was hit in the airstrikes). When the first airstrikes hit the main hospital building, two of the three operating theatres were in use. Three international and twenty-three national MSF staff were caring for patients or performing surgeries in this same main building. There were eight patients in the ICU and six patients in the area of the operating theatres. Those who survived the US airstrikes were direct witnesses of the attack from the different locations inside the MSF compound. MSF staff recall that the first room to be hit was the ICU, where MSF staff were caring for a number of immobile patients, some of whom were on ventilators. Two children were in the ICU. MSF staff were attending to these critical patients in the ICU at the time of the attack and were directly killed in the first airstrikes or in the fire that subsequently engulfed the building. Immobile patients in the ICU burned in their beds. After hitting the ICU, the airstrikes then continued from the east to west end of the main hospital building. The ICU, archive, laboratory, ER, x-ray, outpatient department, mental health and physiotherapy departments as well as the operating theatres were all destroyed in this wave after wave of strikes. After the first strike, MSF medical teams working in the operating theatres ran out of the OT and sought shelter in the sterilisation room. The two patients on the operating table in the OTs were killed in the airstrikes. The MSF international staff members sleeping in the administrative building were woken up by the sound of the first explosions. An MSF nurse arrived at the administrative building covered from head to toe in debris and blood with his left arm hanging from a small piece of tissue after having suffered a traumatic amputation in the blast. The MSF nurse was bleeding from his left eye and oropharynx. Immediate treatment was provided in an attempt to stabilise the nurse by the medical team in the administrative building.